This arts and crafts coal scuttle is a truly magnificent piece of arts and crafts fireplace furniture. 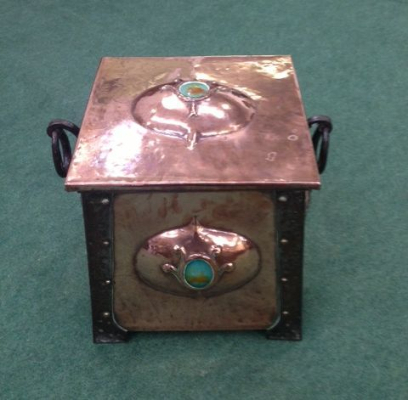 This stunning late Victorian beaten copper coal box features ornate wrought iron handles, and is in excellent condition for its age. The arts and crafts coal box also still retains its original liner inside. This is probably one of the best arts and crafts coal boxes that we have ever had, and it would make a fantastic feature for any period property. This item can be posted for a cost of £15.00.